Note: this is a companion article to last week's column at the Washington Post. One of the common defenses of a run-heavy offense is that offenses need to make their third downs “manageable,” meaning short enough so that conversion is easier. The thinking goes that if an offense runs on either or both first and second down, it is relatively assured of shorter rather than longer distances on third down. At first look, this makes a lot of sense. After all, who wants to face third and long? There are two problems with this argument. The first is that football is not a game of piling up first downs. The days of inching toward the goal line on 18-play drives are long gone if they ever existed at all. Football is, for the most part, a game of maximizing score differential, and the concept of Expected Points shows that NFL offenses are generally running too often on first and second down. The second problem is that even if gaining a first down is the primary objective, running on first down is becoming a worse idea every year. 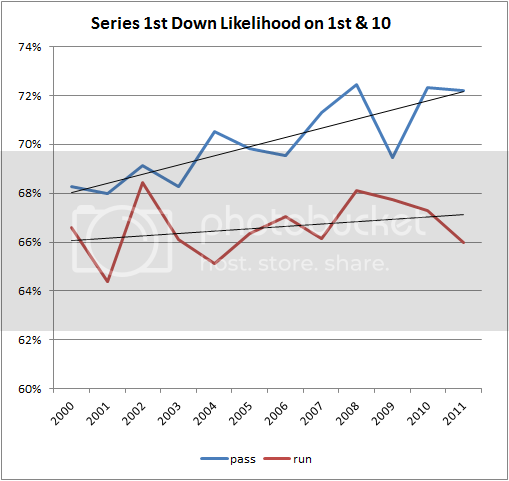 The graph below shows that passing on first down leads to a conversion more often than running on first down. As usual, I limited the data to plays in ‘normal’ football situations, when the score is relatively close and time is not yet a factor at the end of either half. Whatever the reason, it’s apparent that running to move the chains makes an offense less likely to convert. There are very good reasons for running and some situations do call for a run-heavy strategy mix, but it does not make an offense more likely to convert. What if the first down pass falls incomplete? 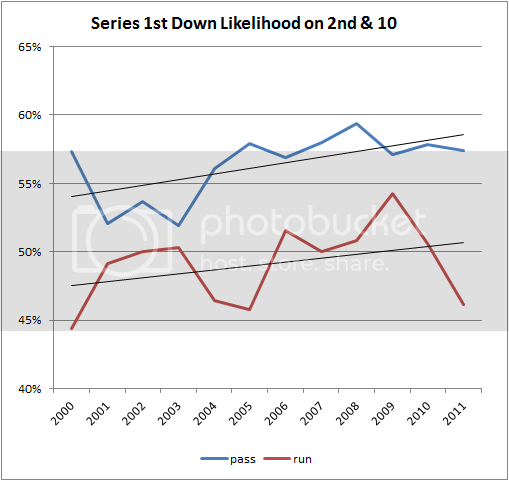 Should the offense run to more or less guarantee a more ‘manageable’ third down, or should it pass more often? 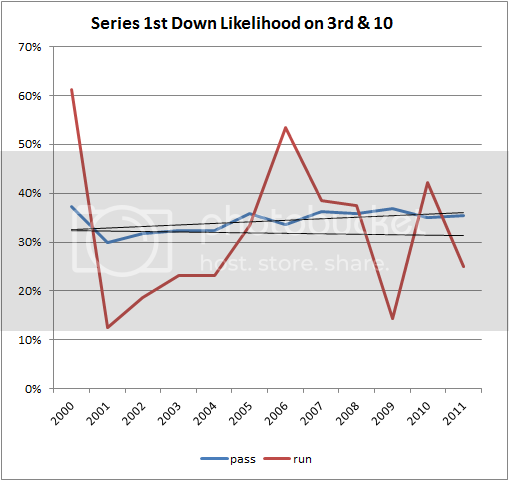 The next graph shows conversion percentages on 2nd and 10. Passing remains the more successful option, and every year it is becoming more successful. Here’s where it gets a little more interesting. On third and 10, passing is no more successful than running at converting. Teams run so infrequently in that situation that defenses are less prepared. This tells us offenses (and defenses) are choosing the two strategies in the correct proportion, at least as long as converting is the measure of ultimate utility. 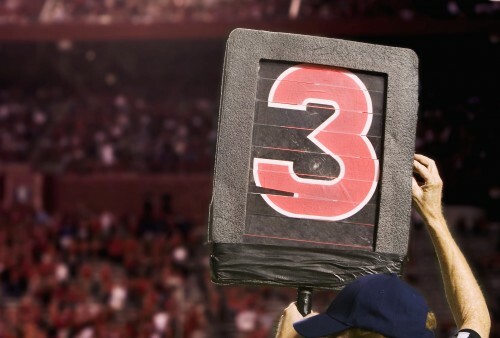 Why are offenses consistently correct on third down but off the mark on 1st and 2nd downs? I think the answer is that the results of each strategy are immediately apparent to coaches and coordinators on third down but not on first or second down. The feedback is not a statistical abstraction like ‘future probability of conversion’ or Expected Points, but rather an instantly concrete result. Either the punting team is jogging onto the field or your offense just successfully moved the chains. It’s much easier to statistically, or even intuitively, find the optimum mix when the results are immediately apparent.